Mass spectrometry has long been recognized as one of the leading analytical tools for the rapid characterization of biological macromolecules. The imaging function of mass spectrometry combines the capabilities of quantitative and qualitative identification with information on the location of an analyte within a sample. To achieve the maximum yield of information, it is necessary to optimize spatial resolution and mass spectral quality. Usually the optimization of one of these factors is detrimental to the other. In this report, we describe the use of a dry sublimation device, which enabled us to perform spatial resolution of 10 µm, resolving individual cells within tissues. To optimize sample preparation, we have investigated various approaches of applying the MALDI matrix to prepared slides. The general trend with these techniques is tht the “drier” the preparation, the smaller the matrix crystal size and consequent improvement in resolution. By employing sublimation, we avoid the use of solvents completely, resulting in improved spatial resolution, especially suited for the assessment of the limits of the instrument performance. With large crystal no longer a limiting factor, it was possible to examine the role of minimum laser focus diameter and the precision of the sample stage movement in determining the limitations of spatial resolution by analyzing phospholipids, which desorb quite well from sublimed matrix. As an experimental tissue, we selected rat cerebellum and testis. The choice was based upon the diversity and dimension of architectural features within these tissues. Cryosections of fresh frozen rat cerebellum and testis were cut at 10 μm thickness and thaw-mounted onto indium-tin-oxide (Bruker) coated glass slides. Sample slides were not washed but rather directly desiccated in a vacuum desiccator for 1 hour. Sublimation was performed in a custom built device using a 152 mm inner diameter sublimation apparatus (Ace Glass) with 2,5-dihydroxybenzoic acid as matrix. MALDI imaging measurements were executed on Bruker’s ultrafleXtreme™, autoflex™ Speed, and solariX™ mass spectrometry instruments equipped with smartbeam IITM lasers. The standard laser setting of “minimum” diameter was used for all measurements. FlexImaging software (Bruker) was employed to establish the imaging measurements and to generate ion images from the acquired data. MALDI-TOF images were normalized to total ion count, and MALDI-FTMS (Fourier Transform Mass Spectrometry) images were normalized to root mean square intensity. The intensity thresholds for the reconstructed MALDI images were adjusted to result in bright images and low noise. After image collection, the slides were removed and washed in ethanol to remove matrix and stained using a standard hematoxylin and eosin (H&E) protocol. Microscopic images were acquired on a Mirax desk slide scanner (Zeiss). Figure 1. MALDI images: 10 pixel size. (A) Three selected masses profiling cellular location (green, individual Purkinje cells; red, cerebellar white matter; purple, granular layer). (B) Two selected mass signals showing strong spatial differentiation. (C) Optical image of the measured cerebellum with measured region shown for context. Scale bars: 200 µm. Figure 1 shows phospholipid images which map to the main features of the rat cerebellum, including the white matter, granular layer, Purkinje cell layer surrouding the granular layer, and molecular layer. The body of the Purkinje cell has an average diameter of ~30 μm in the rat, making it an ideal structure to test MALDI imaging spatial resolution. Figure 1 shows two reconstructed MALDI images of five selected mass signals and an optical image of the measured area. 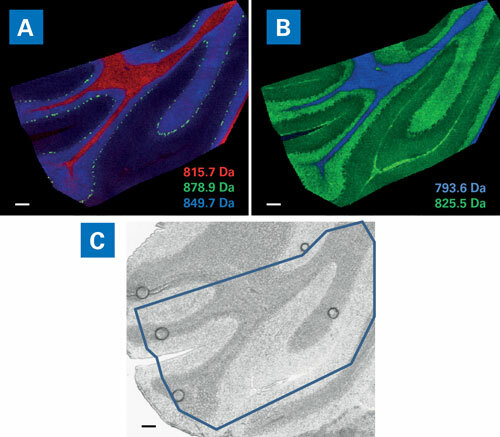 In Figure 1A, the mass signal at 815.7 Da (displayed in red) is localized to the cerebellar white matter and the signal at 849.7 Da (in blue) is found in the granular layer. The mass signal at 878.9 Da is seen as a line of green dots that correspond to individual Purkinje neurons. The signal at 825.5 Da is seen in Figure 1B as a well-structured image displaying several anatomical features. 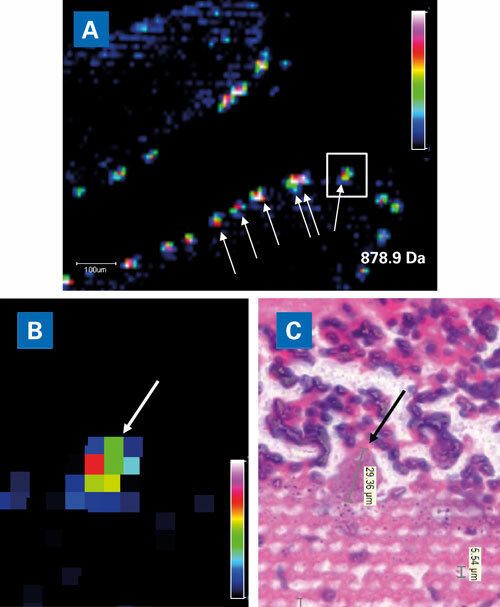 Figure 2 shows MALDI images of the signal at 878.9 Da at increasing magnification. In progressively greater detail, Figures 2A & 2B show that the mass signal at 878.9 Da is indeed localized to the Purkinje cell layer. After the MALDI acquisition, an H&E stained image of the section was acquired and is shown in Figure 2C. Individual Purkinje cells are indicated by arrows on both molecular and microscopic images. That the cell bodies are represented by multiple pixels suggests that the spatial resolution is higher than 30 μm. The Purkinje cell body has a diameter of ~30 μm, and is represented by 3 × 3 mass spectrometric pixels, clearly demonstrating an actual mass spectrometric pixel size of 10 μm. Figure 2. High-resolution MALDI imaging resolves single Purkinje cells in rat cerebellum. (A) Image of phospholipid specific to Purkinje cells surrounding the granular layer. (B) An enlarged view of an individual Purkinje cell. 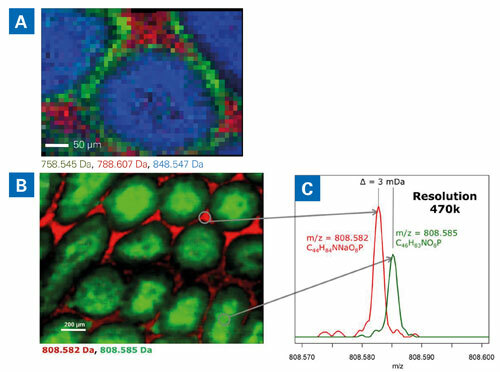 (C) H&E image of the region shown in B.
FTMS instruments are especially suited for imaging of small molecules such as lipids because of their unsurpassed mass resolution and measurement accuracy. For this reason, we also investigated MALDI-FTMS imaging of the rat testis sample. Five structurally localized ions are shown in Figures 3A & 3B without display interpolation so that every visible square pixel represents one mass spectrum. From the three selected mass signals in Figure 3A we see that a pixel size of 10 μm is sufficient to clearly distinguish the layer surrounding the tubules, the interstitial space, and the lumen of the tubules. Figure 3B shows the distribution of two mass signals that are only 3 mDa apart and exhibit very different distribution in the tissue. One mass signal is detected only from the interstitial space while the other is detected in the lumen of the tubules. The two peaks (as detected from the pixels highlighted in Figure 3B) are shown in Figure 3C. In this broadband (wide m/z range) FTMS measurement, the average mass resolving power was approximately 470,000. Because of the high mass resolving power, the peaks at 808.58192 and 808.58554 are shown to have different spatial localization. Furthermore, the measurement accuracy of the FTMS permits direct estimation of the molecular formulas labeled in Figure 3C. The mass signal at 808.58192 Da likely corresponds to the molecular formula [C44H84NNaO8P]+ (a calculated mass of 808.582676 Da, a 0.94 ppm deviation from the measured mass). The signal at 808.58554 Da most likely corresponds to the molecular formula [C46H83NO8P]+ (a calculated mass of 808.585082 Da, a 0.14 ppm deviation from the measured mass). Figure 3. Rat testis imaged at 10 µm pixel size with MALDI-FTMS. (A) Image showing three peaks localized to tubule lumen, blue; basal layer, green; interstitial space; red. (B) Image of two isobaric compounds localized to tubule lumen and interstitial space with arrows connecting to respective mass signals. (C) Resolved mass signals from B with suggested molecular formulae. Sample preparation and instrumental parameters compete to be the limiting factor for achieving high spatial resolution in MALDI imaging. Sublimation of matrix offers an ideal dry preparation for MALDI imaging of lipids in which matrix crystal size and analyte migration do not limit high spatial resolution. Using this preparation strategy, we were able to achieve a spatial resolution of 10 μm using standard commercial ultrafleXtreme, autoflex speed, and solariX instruments with the smartbeam II laser. Shannon Cornett, Ph.D. (shannon.cornett@bdal.com), applications development manager, Bruker Daltonics.